Excerpted from from Steps toward Inner Peace by Peace Pilgrim. Original version is not under copyright, and is freely available. All rights reserved. No part of this excerpt may be reproduced or reprinted without permission in writing from the publisher. HTML and web pages copyright © by SpiritSite.com. In my early life I made two very important discoveries. In the first place I discovered that making money was easy. And in the second place I discovered that making money and spending it foolishly was completely meaningless. I knew that this was not what I was here for, but at that time (this was many years ago), I didn't know exactly what I was here for. It was out of a very deep seeking for a meaningful way of life, and after having walked all one night through the woods, that I came to what I now know to be a very important psychological hump. I felt a complete willingness, without any reservations, to give my life, to dedicate my life to service. I tell you, it is a point of no return. After that, you can never go back to completely self-centered living. From that time on, I have known that my life-work would be work for peace; that it would cover the entire peace picture – peace among nations, peace among groups, peace among individuals, and the very, very important inner peace. However, there's a great deal of difference between being willing to give your life, and actually giving your life, and for me, 15 years of preparation and of inner seeking lay between. During this time I became acquainted with what Psychologists refer to as Ego and Conscience. I began to realize that it's as though we have two selves or two natures or two wills with two different viewpoints. Because the viewpoints were so different, I felt a struggle in my life at this period between the two selves with the two viewpoints. So there were hills and valleys – lots of hills and valleys. Then in the midst of the struggle there came a wonderful mountain-top experience, and for the first time I knew what inner peace was like. I felt a oneness – oneness with all my fellow human beings, oneness with all of creation. I have never felt really separate since. I could return again and again to this wonderful mountaintop, and then I could stay there for longer and longer periods of time, and just slip out occasionally. Then came a wonderful morning when I woke up and knew that I would never have to descend again into the valley. I knew that for me the struggle was over, that finally I had succeeded in giving my life, or finding inner peace. Again this is a point of no return. you can never go back into the struggle. The struggle is over now because you will do the right thing, and you don't need to be pushed into it. The world may look at you and believe that you are facing great problems, but always there are the inner resources to easily overcome these problems. Nothing seems difficult. There is a calmness and a serenity and unhurriedness – no more striving or straining about anything. Life is full and life is good, but life is nevermore overcrowded. That's a very important thing I've learned: If your life is in harmony with your part in the Life Pattern, and if you are obedient to the laws which govern this universe, then your life is full and good but not overcrowded. If it is overcrowded, you are doing more than is right for you to do, more than is your job to do in the total scheme of things. Now there is a living to give instead of to get. As you concentrate on the giving, you discover that just as you cannot receive without giving, so neither can you give without receiving – even the most wonderful things like health and happiness and inner peace. There is a feeling of endless energy – it just never runs out; it seems to be as endless as air. You just seem to be plugged into the source of universal energy. You are now in control of your life. You see, the ego is never in control. The ego is controlled by wishes for comfort and convenience on the part of the body, by demands of the mind, and by outbursts of the emotions. But the higher nature controls the body and the mind and the emotions. I can say to my body, "Lie down there on that cement floor and go to sleep," and it obeys. I can say to my mind, "Shut out everything else and concentrate on this job before you," and it's obedient. I can say to the emotions, "Be still, even in the face of this terrible situation," and they are still. It's a different way of living. The philosopher Thoreau wrote: If a man does not keep pace with his companions, perhaps he hears a different drummer. And now you are following a different drummer – the higher nature instead of the lower. It was only at this time, in 1953, that I felt guided or called or motivated to begin my pilgrimage for peace in the world – a journey undertaken traditionally. The tradition of pilgrimage is a journey undertaken on foot and on faith, prayerfully and as an opportunity to contact people. I wear a lettered tunic in order to contact people. It says 'PEACE PILGRIM' on the front. I feel that's my name now – it emphasizes my mission instead of me. And on the back it says '25,000 MILES ON FOOT FOR PEACE.' The purpose of the tunic is merely to make contacts for me. Constantly as I walk along the highways and through the cities, people approach me and I have a chance to talk with them about peace. With me I carry always my peace message: This is the way of peace: Overcome evil with good, falsehood with truth, and hatred with love. There is nothing new about this message, except the practice of it. And the practice of it is required not only in the international situation but also in the personal situation. I believe that the situation in the world is a reflection of our own immaturity. If we were mature, harmonious people, war would be no problem whatever – it would be impossible. All of us can work for peace. We can work right where we are, right within ourselves, because the more peace we have within our own lives, the more we can reflect into the outer situation. In face, I believe that the wish to survive will push us into some kind of uneasy world peace which will then need to be supported by a great inner awakening if it is to endure. I believe we entered a new age when we discovered nuclear energy, and that this new age calls for a new renaissance to lift us to a higher level of understanding so that we will be able to cope with the problems of this new age. So, primarily my subject is peace within ourselves as a step toward peace in our world. 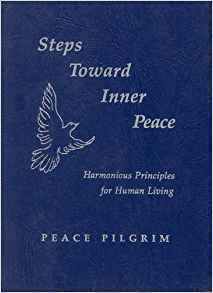 Now, when I talk about the steps toward inner peace, I talk about them in a framework, but there's nothing arbitrary about the number of steps. They can be expanded; they can be contracted. This is just a way of talking about the subject, but this is important: the steps toward inner peace are not taken in any certain order. The first step for one may be the last step for another. So, just take whatever steps seem easiest for you, and as you take a few steps, it will become easier for you to take a few more. In this area we really can share. None of you may feel guided to walk a pilgrimage, and I'm not trying to inspire you to walk a pilgrimage, but in the field of finding harmony in our own lives, we can share. And I suspect that when you hear me give some of the steps toward inner peace, you will recognize them as steps that you also have taken. In the first place I would like to mention some preparations that were required of me. The first preparation is a right attitude toward life. This means – stop being an escapist! Stop being a surface-liver who stays right in the froth of the surface. There are millions of these people, and they never find anything really worthwhile. Be willing to face life squarely and get down beneath the surface of life where the verities and realities are to be found. That's what we are doing here now. There's the whole matter of having a meaningful attitude for the problems that life may set before you. If only you could see the whole picture, if only you knew the whole story, you would realize that no problem ever comes to you that does not have a purpose in your life, that cannot contribute to your inner growth. When you perceive this, you will recognize problems as opportunities in disguise. If you did not face problems you would just drift through life, and you would not gain inner growth. It is through solving problems in accordance with the highest light that we have that inner growth is attained. Now, collective problems must be solved by us collectively, and no one finds inner peace who avoids doing his or her share in the solving of collective problems, like world disarmament and world peace. So let us always think about these problems together, talk about them together, and collectively work toward their solutions. There is also a fourth preparation, and it is the simplification of life to bring inner and outer well-being – psychological and material well-being – into harmony in your life. This was made very easy for me. Just after I dedicated my life to service, I felt that I could no longer accept more than I needed while others in the world have less than they need. This moved me to bring my life down to need-level. I thought it would be difficult. I thought it would entail a great many hardships, but I was quite wrong. Now that I own only what I wear and what I carry in my pockets, I don't feel deprived of anything. For me, what I want and what I need are exactly the same, and you couldn't give me anything I don't need. I discovered this great truth: unnecessary possessions are just unnecessary burdens. Now I don't mean that all our needs are the same. Yours may be much greater than mine. For instance, if you have a family, you would need the stability of a family center for your children. But I do mean that anything beyond need – and need sometimes includes things beyond the physical needs, too – anything beyond need tends to become burdensome. Then I discovered that there were some purifications required of me. The first one is such a simple thing: it is purification of the body. This has to do with your physical living habits. Do you eat sensibly, eating to live? I actually know people who live to eat. And do you know when to stop eating? That is a very important thing to know. Do you have sensible sleeping habits? I try to get to bed early and have plenty of hours of sleep. Do you get plenty of fresh air, sunshine, exercise and contact with nature? You'd think this might be the first area in which people would be willing to work, but from practical experience I've discovered it's often the last because it might mean getting rid of some of our bad habits, and there is nothing that we cling to more tenaciously. Your motives, if you are to find inner peace, must be an outgoing motive – it must be service. It must be giving, not getting. I knew a man who was a good architect. It was obviously his right work, but he was doing it with the wrong motive. His motive was to make a lot of money and keep ahead of the Joneses. He worked himself into an illness, and it was shortly after, that I met him. I got him to do little things for service. I talked to him about the joy of service and I knew that after he had experienced this, he could never go back into really self-centered living. We corresponded a bit after that. On the third year of my pilgrimage route, I walked through his town and I hardly recognized him when I stopped in to see him. He was such a changed man! But he was still an architect. He was drawing a plan and he talked to me about it: "You see, I'm designing it this way to fit into their budget, and then I'll set it on their plot of ground to make it look nice." His motive was to be of service to the people that he drew plans for. He was a radiant and transformed person. His wife told me that his business had increased because people were now coming to him from miles around for home designs. Now the last part. These are the relinquishments. Once you've made the first relinquishment, you have found inner peace because it's the relinquishment of self-will. You can work on this by refraining from doing any not-good thing you may be motivated toward, but you never suppress it! If you are motivated to do or say a mean thing, you can always think of a good thing. You deliberately turn around and use that same energy to do or say a good thing instead. It works! One last comment about negative feelings which helped me very much at one time and has helped others. No outward thing – nothing, nobody from without – can hurt me inside, psychologically. I recognized that I could only be hurt psychologically by my own wrong actions, which I have control over; by my own wrong reactions – they are tricky but I have control over them, too; or by my own inaction in some situations, like the present world situation, that needs actions from me. When I recognized all this, how free I felt! And I just stopped hurting myself. Now someone could do the meanest thing to me and I would feel deep compassion for this out-of-harmony person, this psychologically sick person who is capable of doing mean things. I certainly would not hurt myself by a wrong reaction of bitterness or anger. You have complete control over whether or not you will be hurt psychologically, and any time you want to, you can stop hurting yourself. A: Because I talk about spiritual truth, and spiritual truth should never be sold – those who sell it injure themselves spiritually. The money that comes in the mail – without being solicited – I do not use for myself; I use it for printing and postage. Those who attempt to buy spiritual truth are trying to get it before they are ready. In this wonderfully well-ordered universe, when they are ready, it will be given. A: Retirement should mean, not a cessation of activity, but a change of activity with a more complete giving of your life to service. It should therefore be the most wonderful time of your life – the time when you are happily and meaningfully busy. A: God is Love, and whenever you reach out in loving kindness, you are expressing God. God is Truth, and whenever you seek truth, you are seeking God. God is Beauty, and whenever you touch the beauty of a flower or a sunset, you are touching God. God is the Intelligence that creates all and sustains all and binds all together and gives life to all. Yes, God is the Essence of all. So you are within God and God is within you – you could not be where God is not. Permeating all is the law of God – physical law and spiritual law. Disobey it and you feel unhappiness – you feel separated from God. Obey it and you feel harmony – you feel close to God. A: Good things are of benefit to you and to others. You may get some inspiration from the outside, but in the final analysis you must know from the inside what good things you want to fill your life with. Then you can make a schedule of what you think the good life should be like, and live according to that schedule. It may include something beneficial to the body – like walking or exercise. Or something stimulating to the intellect – like meaningful reading. And something uplifting for the emotions – like good music. But most important of all, it needs to include service to others if it is to be spiritually beneficial to you. A: I would say that a truly religious person has religious attitudes: a loving attitude toward fellow human beings, an obedient attitude toward God – toward God's laws and God's guidance, and a religious attitude toward self – knowing that you are more than the self-centered nature, more than the body, and life is more than the earth life. A: I would say that religious attitudes overcome fear. If you have a loving attitude toward your fellow human beings, you will not fear them. "Perfect love casteth out fear." An obedient attitude toward God will bring you into constant awareness of God's presence, and then fear is gone. When you know that you are only wearing the body, which can be destroyed – that you are the reality which activates the body and cannot be destroyed – how can you be afraid? I had a very favorable beginning, although many of you might not think so. I was born poor on a small farm on the outskirts of a small town, and I'm thankful for that. I was happy in my childhood. I had a woods to play in and a creek to swim in and room to grow. I wish that every child could have growing space because I think children are a little like plants. If they grow too close together they become thin and sickly and never obtain maximum growth. We need room to grow. We begin to prepare for the work that we have to do and customarily we have no idea what we are preparing for. So as a child I had no idea what I was preparing for. And yet, of course, I was in many respects preparing. I was preparing for the pilgrimage when I chose my rule of "first things first" and began to set priorities in my life. It led to a very orderly life and it taught me self discipline – a very valuable lesson, without which I could never have walked a pilgrimage. I carried it right into my adult life. I received no formal religious training as a child. (It would be less that I would have to undo from my mind later on!) My first view inside a church was when I was twelve years old and I looked through the doorway of a Catholic church to watch janitors clean the cathedral. When I was sixteen I entered a church for the first time to attend a wedding. When I was a senior in high school I began to make my search for God, but all my efforts were in an outward direction. I went about inquiring, "What is God? What is God?" I was most inquisitive and I asked many questions of many people, but I never received any answers! However, I was not about to give up. Intellectually I could not find God on the outside, so I tried another approach. I took a long walk with my dog and pondered deeply upon the question. Then I went to bed and slept over it. And in the morning I had my answer from the inside, through a still small voice. Now my high school answer was a very simple answer- that we human beings just lump together everything in the universe which is beyond the capacity of all of us, and to all those things together some of us give the name God. Well, that set me on a search. And the first thing I did was to look at a tree, and I said, there's one. All of us working together couldn't create that one tree, and even if it looked like a tree it wouldn't grow. There is a creative force beyond us. And then I looked at my beloved stars at night and there's another. There's a sustaining power that keeps planets in their orbit. I watched all the changes taking place in the universe. At that time they were trying to keep a lighthouse from washing into the sea. They finally moved it inland and said they had saved it. But I noticed all these changes and I said, there's another. There is something motivating towards constant change in the universe. Intellectually I touched God many times as truth and emotionally I touched God as love. I touched God as goodness. I touched God as kindness. It came to me that God is a creative force, a motivating power, an over-all intelligence, an ever- present, all pervading spirit- which binds everything in the universe together and gives life to everything. That brought God close. I could not be where God is not. You are within God. God is within you. I was working in the five-and-ten-cent store between my junior and senior year in high school. I just loved the work, especially fixing up counters so they would look pretty. They even let me fix up the windows because I liked to do that. Well, you know, I was cheaper than a window decorator! I had two registers at my counter. One day I didn't have the proper change in one register so naturally I went over to the other and rang "no sale" and took out the change. Then I discovered I had committed a cardinal sin. I heard them whispering, "She rang no sale!" The male floorwalker came over and said, "Come with me." He put me at a counter in a corner that needed fixing up. He left me there, and then came back and said, "Why did you do that?" I replied, "I still don't know what I did. I just took change out of the register – I didn't steal any money." He said, "You were instructed never to ring 'no sale'." I answered, "I wasn't instructed at all." Then he went to the female floor walker who was supposed to instruct me. I was reinstated. But, because of the incident, she then hated me. I knew that something needed to be done about it. Then I passed her desk and noticed a few faded flowers there. The next morning I brought her a beautiful bouquet of flowers from my garden. I said, "I noticed those faded flowers. I know you love flowers and here are some from my garden." She couldn't resist them. At the end of the week we walked out of there arm in arm! I feel sure I was being prepared for the pilgrimage when I read the Golden Rule in history, "Do unto others what you would have others do unto you" – expressed in a lot of different ways and pointing out that every culture had one. It got an inner confirmation from me. It affected my entire life. In fact, there were certain offshoots of the Golden Rule which carried over even into the pilgrimage. When I was in high school I had a little saying, If you want to make friends, you must be friendly. If you analyze it, that is an offshoot of the Golden Rule. It is the recognition that people react according to the influences brought to bear upon them. I have it in my life today with my little saying, If you want to make peace, you must be peaceful. I put the Golden Rule into practice just beyond my student days. I was given a job that one of my girl friends wanted, and I was elected to an office in a community club that she also wanted. I thought she hated me. She said all kinds of mean things about me. I knew it was a very unhealthy situation. So I hauled out the Golden Rule – I thought of and said every possible kind thing that could be truthfully said about her. I tried to do her favors. It fell to my lot to do her a significant favor. And to make a long story short, when she was married a year later I was maid of honor at her wedding. See how a little bit of spiritual practice goes a long way? I know I was being prepared for the pilgrimage when I made certain choices. For instance, I was in grammar school when I was offered cigarettes from a package, which I did not smoke but my friends did. In high school I was offered all kinds of alcohol, which I did not drink but my friends did. Then just after my student days I was faced with a kind of test because all my friends at that time used both alcohol and tobacco. There was such a push towards conformity in those days – they call it peer pressure now – that they actually looked down on me because I didn't do these things. And gathered in someone's living room I said to them, "Look, life is a series of choices and nobody can stop you from making your choices, but I have a right to make my own choices, too. And I have chosen freedom." I also made two very important discoveries as time went on. In the first place, I discovered that making money was easy. I had been led to believe that money and possessions would insure me a life of happiness and peace of mind. So that was the path I pursued. In the second place, I discovered that making money and spending it foolishly was completely meaningless. I knew that this was not what I was here for, but at that time I didn't know exactly what I was here for. It was really the realization that money and things would not make me happy that got me started on my preparation for the pilgrimage. You may wonder how in the world I got involved with money and things in the first place, but you see, we are taught these sets of opposites which are extremely confusing. I was very fortunate in that I was only confused by one of these sets of opposites; most people are confused by both. On the one hand I was trained to believe that I should be kind and loving and never hurt anybody, which is fine. On the other hand I was trained to believe that if so ordered it is indeed honorable to maim and kill people in war. They even give medals for it. Now that one did not confuse me. I never believed there was any time under any circumstances when it was right for me to hurt anybody. I was trained to be generous and unselfish, and at the same time trained to believe that if I wanted to be successful I must get out there and grab more than my share of this world's goods. These conflicting philosophies which I had gathered from my childhood environment confused me for some time. But eventually I uprooted this false training. In the beginning I undertook my walking not only to contact people, I undertook it as a prayer discipline to keep me concentrated on my prayer for peace. I hadn't learned yet to pray without ceasing. I also undertook a forty-five day period of prayer and fasting as a prayer discipline. After the first few years the prayer discipline was completely unnecessary, because I had learned to pray without ceasing. I made the contact so thoroughly that into my prayer consciousness I put any condition or person in the world I am concerned about and the rest takes place automatically. Occasionally some condition is brought back into my conscious mind because I need to really concentrate on it. If some person is in dire difficulty, and that person returns to my mind for thought, I sometimes use the prayer of visualization, which has always been very natural for me, but I understand not so for everybody. I reach out – my divine nature reaches out – to contact their divine nature. Then I have the feeling of lifting them, lifting them, lifting them, and I have the feeling of bringing God's light to them. I try to envision them bathed in God's light, and finally I do see them standing and reaching out their arms bathed in golden light. At that point I leave them in God's hands. In all people I meet – though some may be governed by the self-centered nature and may not know their potential at all – I see that divine spark, and that's what I concentrate on. All people look beautiful to me; they look like shining lights to me. I always have the feeling of being thankful for these beautiful people who walk the earth with me. So I would say part of my prayer is a feeling of thankfulness, and of course a feeling of genuine love for all of God's children and all of God's creation. Prayer is a concentration of positive thoughts. That's a little bit about prayer. Several times people have written to me and said, "Peace, will you pray with me at four o'clock in the afternoon or nine o'clock in the evening, which is such and such a time, daylight saving time?" I write and tell them, "You don't have to figure all that out for me – plug in at anytime and you will be praying with me, and I will be praying with you, because I pray without ceasing." Praying without ceasing is not ritualized, nor are there even words. It is a constant state of awareness of oneness with God; it is a sincere seeking for a good thing; and it is a concentration on the thing sought, with faith that it is obtainable. All right prayer has good effect, but if you give your whole life to the prayer you multiply its power...No one really knows the full power of prayer. Of course, there is a relationship between prayer and action. Receptive prayer results in an inner receiving, which motivates to right action. Let me tell you a story about an answer to prayer. I was picked up late one night by a young policeman as I was walking along a lonely highway. I believe he was thinking in terms of protective custody. He said to me, "Why, nobody in this town would walk out along this highway at this time of night." I said to him, "Well, you see, I walk completely without fear. Therefore I'm not attracting things which are not good. It says, That which I feared came upon me. But fear nothing and expect only good." He took me in anyhow, and I found myself in a cell. The floor was littered with old newspapers and cigarette butts and every old thing. The accommodations consisted of a single mattress on the floor and four ragged blankets. There were two women attempting to sleep together on that single mattress. They told me there had been eight women in that cell the night before with those accommodations. There was a rather nice feeling among the prisoners in general. They said to me, "You'll need to have two blankets because you'll be sleeping on the floor." So I took a newspaper and cleared a place on the floor, then put one blanket down and the other blanket over me and slept comfortably enough. "What time does court convene?" He said, "I don't know." I said, "Well, aren't you a policeman?" "No," he said, "I just like to look at the girls." It was one of the town sports. Anyone could come in right off the street and see what they had there today: "Let's go look at the girls!" One of the women was middle aged and was being held for being drunk and disorderly. It was her seventh offense, she told me, so it wasn't so hard on her. But the other was an eighteen year old girl. She felt her entire life was ruined because of this experience. I said, "It's my second time and I certainly don't think my life is ruined!" I got her all cheered up and we talked about what she'd do when she got out. She was to get out that day or the next day. Then they changed the guards. I never saw a matron. The new guard saw me and said, "What are you doing in there? I saw your picture in the newspaper. I heard you over the air." Then they just let me go. But before I left I got a broom from the man who cleaned up around there and gave it to the girls so they could clean up their cell. I also got them a comb; their hair was all matted. They had been there about a week without a comb. What I really wanted to tell you is that the eighteen year old girl was a deeply religious person. She had been desperately praying for help. I believe that I was picked up off the highway that night and set behind prison bars in answer to her prayers. The most important part of prayer is what we feel, not what we say. We spend a great deal of time telling God what we think should be done, and not enough time waiting in the stillness for God to tell us what to do. Now, beside God's laws, which are the same for all of us, there is also God's guidance and that is unique for every human soul. If you don't know what God's guidance for your life is, you might try seeking in receptive silence. I used to walk receptive and silent amidst the beauties of nature. Wonderful insights would come to me which I then put into practice in my life. You might prefer listening to beautiful, uplifting music, reading a few beautiful words and pondering on them. To me, the beauties of nature were always the most inspiring, and so actually that was my time alone with God. It didn't last more than an hour, if that, and I got so much from it. Now the young folks talk to me today about things like breathing exercises and meditation techniques, which in some cultures are definitely religious practices. But I say, look what I got from my time alone with God: from the beauty around me, my inspiration; from the silent receptiveness, my meditation; and from my walking, not only my exercise but my breathing. Four things at once! I believe in making very good use of my time. And you can't be too pushy when you're doing four things at once. Foolish people have sometimes used very strenuous breathing exercises or meditation techniques that tore them apart and pushed them into an undesirable state instead of into the spiritual state. (Yes, that was long before psychedelic drugs!) I always think of the bud of a flower. If you give it proper conditions it will open into a beautiful flower, but if you're impatient and try to tear the petals open you permanently injure the flower for the earth life. The flower can be equated with the earthly human life. Give the spiritual growing-up the proper growing conditions and it will open into a thing of beauty. I have been asked about my forty-five day period of prayer and fasting. I undertook it as a prayer discipline, to keep me concentrated on my prayer for peace. It was in the second year of my pilgrimage when I was coming slowly back across the country and I wasn't walking extensively. Fasting can have a great deal of spiritual significance, and though I had already found inner peace, it may have been that the fast helped me to learn to pray without ceasing. While I fasted I was at the home of a chiropractor who used fasting for healing. He wanted to see how a well person would react to a fast because he had never fasted a well person. I talked to him as a friend; he just observed me, he didn't examine me. (There are many doctors, including medical doctors, who are my friends – but none of them have ever treated me or even examined me. Although occasionally a dentist friend will repair an old cavity which came from my poor eating habits in younger days.) The last meal before my fast was a grapefruit and two oranges, so I wasn't thirsty. The first three days were undertaken without food or water. After that I took distilled water at room temperature. Nothing else. And when I broke my fast it was not unusual – it was the regular way to break a fast. The juice of one freshly squeezed orange every hour the first day. The juice of two freshly squeezed oranges, alternating with the juice of one grapefruit, every two hours the second day. A grapefruit and two oranges three times the third day, and after that adding a little bit until in a week I was able to eat full rations. It was no different from the usual pattern of fasting. I did obey the laws of fasting: no extreme exertion. I did not walk long distances, though I did walk some. I did some typing for the doctor. I typed until he took the typewriter away about a month along in the fast. He didn't think I ought to handle it anymore, so then I wrote by hand, which was really harder than typing. But I do the best I can with these things. I didn't go in and talk to his patients as much as I would have liked to because he didn't want me to move around that much. I did go to see them occasionally to help keep up their spirits. Once during my fast – I remember I was in a state between wakefulness and sleep – I looked up and saw a dismal cross above me. It was just hanging there, and I knew someone must take up the burden. I reached up to accept it and I was immediately lifted above the cross where all was light and beauty. All that was needed was the willingness to accept the burden – and then I was raised above it. Instead of hardships, I found a wonderful sense of peace and joy. Are you a slave to your self-centered nature, or does your divine nature guide your life? Do you know that every moment of your life you're creating through thought? You create your own inner condition; you're helping create the conditions around you. Christian teachings tell us that: 'As a man thinketh in his heart, so is he.' Which is saying very clearly that we are creating the conditions around us. If we could look a bit more deeply into life, we might see that physical difficulties are reflections of spiritual difficulties, and that negative thoughts and feelings are much more harmful than disease germs. If you realized how powerful your thoughts are, you would never think a defeatist or negative thought. Since we create through thought, we need to concentrate very strongly on positive thoughts. If you think you can't do something, you can't. But if you think you can, you may be surprised to discover that you can. It is important that our thoughts be constantly for the best that could happen in a situation – for the good things we would like to see happen. I have met some New Age people who had heard some prediction of disaster and were actually concentrating on that. What a terrible thing to do! Why, we're creating every moment of our lives through thought. And we're helping to create the conditions around us. When you hear of any predictions of disaster there's a reason for it. The reason is that you are to throw the entire weight of your positive thought in the opposite direction. For instance, when there were dozens of predictions that half of California was to slide into the sea from a terrible earthquake, I deliberately planned to be in that section of California. There wasn't a tremor. But I missed some of my friends who were on the east coast, playing it safe. Religion is not an end in itself. One's union with God is the ultimate goal. There are so many religions because immature people tend to emphasize trivial differences instead of important likenesses. Differences between faiths lie in creeds and rituals rather than religious principles. How diverse the many paths seem to be at times, but do they not all come together eventually upon the same mountaintop? Are they not all striving for the same thing? If you are guided toward a faith, use it as a stepping stone to God, not as a barrier between yourself and God's other children or as a tower to hold you aloft from others. If you are not guided toward a faith (or even if you are) seek God in the silence – seek within. When we attempt to isolate another we only isolate ourselves. We are all God's children and there are no favorites. God is revealed to all who seek; God speaks to all who will listen. Be still and know God. I read the King James version of the New Testament in its entirety and some excerpts from the Old Testament just after the beginning of my pilgrimage. They are important books to a great number of people, and I felt the need to inquire of their contents in order to make my outreach to others more complete. Yes, the Bible contains a great many truths, but most often these truths are not really understood. People replace the spirit of the law with the letter of the law and truth becomes distorted into falsehood. If you desire confirmation of a truth, it is best to seek it from within and not upon a printed page. You will note that Jesus says, "Why do you call me 'Lord, Lord' and do not what I say?" He expresses this thought more than once. Therefore, it seems to me that a real Christian would be living by the laws of God that Jesus taught. Jesus also says, "Say not, 'Lo here' or 'Lo there', for behold, the Kingdom of God is within you." In so many illustrations he tells people what they are capable of. Real Christians would allow their lives to be governed by the Kingdom of God within – by the God-centered nature – which is sometimes called the indwelling Christ. Many people profess Christianity. Very few live it – almost none. And when you live it people may think you're crazy. It has been truthfully said that the world is equally shocked by one who repudiates Christianity and by one who practices it. I believe Jesus would accept me because I do what he told people to do. This doesn't mean, though, that all who call themselves Christian would accept me. Of course I love and appreciate Jesus and I wish Christians would learn to obey his commandments. It would be a most wonderful world. Evil cannot be overcome by more evil. Evil can only be overcome by good. It is the lesson of the way of love. The contest in the world today is between the old way of attempting to overcome evil with evil, which with modern weapons would lead to complete chaos, and the way of overcoming evil with good, which would lead to a glorious and mature life. We need not reach out to tear down that which is evil because nothing which is contrary to God's laws can endure. All not-good things in the world are transient, containing within themselves the seeds of their own destruction. We can help them to fade away more quickly only insofar as we remain in obedience to God's law that evil must be overcome with good. Those who create something which is evil in order to overcome something else which is evil only double the evil. God's laws are implemented constantly, for everything out of harmony is on its way out. How can anyone doubt that eventually God will prevail? It is only how soon that is up to us. And with how much violence they will pass away is also up to us. Insofar as we are willing to let them go, there will be less violence – insofar as we have been able to build the new within the old, there will be less violence; so let us work on that. Let us help the phoenix to rise from the ashes, let us help lay the foundation for a new renaissance, let us help to accelerate the spiritual awakening until it lifts us into the golden age which would come! In order to help usher in the golden age we must see the good in people. We must know it is there, no matter how deeply it may be buried. Yes, apathy is there and selfishness is there – but good is there also. It is not through judgment that the good can be reached, but through love and faith. Pure love is a willingness to give, without a thought of receiving anything in return. Love can save the world from nuclear destruction. Love God: turn to God with receptiveness and responsiveness. Love your fellow human beings: turn to them with friendliness and givingness. Make yourself fit to be called a child of God by living the way of love. When I first started out, my tunic read PEACE PILGRIM on the front and Walking Coast to Coast for Peace on the back. Through the years the message on the back changed from Walking 10,000 Miles for World Disarmament to Walking 25,000 Miles for Peace and ending with the present message of 25,000 Miles On Foot for Peace. This walking has taken me several times into the forty-eight states and into Mexico and into all ten Canadian provinces. I finished counting miles of walking in Washington, D.C. in the fall of 1964. I said to myself, "25,000 miles is enough to count." It kept me tied to the main highways where mileage are recorded on road maps. They're not good places to meet people. They're just good places to count miles. Now I'm free to walk where people are. Also, mileage are not given for my favorite places to walk: beaches, forest paths and mountain trails. Some things don't seem so difficult, like going without food. I seldom miss more than three to four meals in a row and I never even think about food until it is offered. The most I have gone without food is three days, and then mother nature provided my food--apples that had fallen from a tree. I once fasted as a prayer discipline for 45 days, so I know how long one can go without food! My problem is not how to get enough to eat, it's how to graciously avoid getting too much. Everyone wants to overfeed me! Going without sleep would be harder, although I can miss one night's sleep and I don't mind. Every once in awhile I miss a night's sleep, but not for sometime now. The last time was September of 1977 when I was in a truck stop. I had intended to sleep a little but it was such a busy truck stop that I spent all night talking to truck drivers. The first thing after I went in, a truck driver who'd seen me on television wanted to buy me some food. I sat in a corner booth. Then truck drivers started to arrive, and it was just one wave of truck drivers after another that were standing there and asking me questions, and so forth. I actually talked to them all night and I never did get to do any sleeping. After awhile somebody offered me breakfast and I ate that and left. Another time, a truck driver pulled his truck to the side of the road and said, "I heard you say over television something about that endless energy and I just wanted to tell you I had it one time. I was marooned in a town by a flood. I got so bored that I finally offered to help and I got interested in getting people out. I worked without eating, I worked without sleeping, and I wasn't tired...But I don't have it anymore." I said, "Well, what are you working for now?" "Money," he said. I said, "That should be quite incidental. You have the endless energy only when you are working for the good of the whole--you have to stop working for your little selfish interests." That's the secret of it. In this world you are given as you give! I usually average twenty-five miles a day walking, depending upon how many people stop to talk to me along the way. I have gone up to fifty miles in one day to keep an appointment or because there was no shelter available. On very cold nights I walk through the night to keep warm. When the days are very warm I do a lot of walking at night to avoid the heat. I have walked when the nights were filled with the scent of honeysuckle, the sight of fireflies and the sound of whippoorwills. Once a six foot fellow, confident he could out walk me, walked with me for 33 miles. When he gave up, his feet were blistered and his muscles ached. He was walking on his own strength; I wasn't! I was walking on that endless energy that comes from inner peace. Another time a woman asked me if she could accompany me on the pilgrimage. She told me she wanted to get away from "that husband" of hers. Maybe she did have a calling, but her motive was not the highest. Another lady who wished to accompany me for a day could barely walk by afternoon. I sent her home by bus! I have never experienced any danger on my walks. One time a couple of drunks did follow me in a car, but when I moved off the road they left. Only once has anyone ever thrown something at me: a man in a speeding truck threw a fistful of crumpled dollar bills. I simply gave them to the next church where I spoke. A college student once asked me if I had ever been mugged. "Mugged?" I answered, "You would have to be a crazy person to mug me--I haven't a penny to my name!" There was a time when I was walking out of town at sunset and a well-to-do couple in a big house called me over. They had read about my pilgrimage and felt it was their Christian duty to warn me that ahead on the way lay a very wicked place called 'South of the Border.' They just wanted to warn me not to go near that place. They did not offer food or shelter, however, so I walked on for several hours. The man from the motel was sitting across the table from me and he gave me a room for the night. They also gave me breakfast the next morning. There may have been gambling in the back room; something was going on there. But they treated me in a much more Christian fashion than those who warned me against them. It just demonstrates my point that there is good in everybody. p>I have received hospitality in the most unusual places. These have included a conference table in the Florence, Arizona, city hall and the seat of a fire engine in Tombstone, Arizona. Once I was inadvertently locked for thirteen hours in an icy gas station restroom. My accommodations were quiet and private, although somewhat chilly! I sleep equally well in a soft bed or on the grass beside the road. If I am given food and shelter, fine. If not, I'm just as happy. Many times I am given shelter by total strangers. When hospitality is not available there are always bus depots, railroad stations and all night truck stops. I remember being offered a queen size bed at a fashionable motel one evening and the next evening space on the concrete floor of a twenty-four hour gasoline station. I slept equally well on both. Several times a friendly sheriff would unlock the door of an unoccupied jail cell. When no shelter is available to me, I sleep in the fields or by the side of the road with God to guard me. Bridges always offered protection from the elements, as well as dilapidated barns and empty basements of abandoned homes. Culverts and large pipes often served as lodging. But one of my favorite places to sleep is a large haystack piled in an accessible field on a clear night. The stars are my blanket. Cemeteries are also wonderful places to sleep for the night. They are quiet, the grass is always neatly trimmed, and nobody ever bothers you there. No, there is no intrusion upon the departed spirits. I wish them peace; they understand. But a picnic table at a nearby road stop, a gathering of pine needles in a nearby brush, or the cushion of a blossoming wheat field would serve as well. One morning, when I was sleeping in a Kansas wheat field, I was awakened to a very loud noise. I looked up only to see this huge reaper bearing down on me. I immediately rolled over several times to get out of the way of its swirling blades. Most people interested in vacations are those who are doing things they are not called to do, which they want to get away from for awhile. I couldn't imagine feeling the need of a vacation from my pilgrimage. How good it is to travel south in the fall of the year, experiencing the tranquil beauty of the harvest time--but staying ahead of the frost; experiencing the brilliant beauty of the autumn leaves--but traveling on before they are swept from the trees. How good it is to travel north with the spring, and to enjoy the spring flowers for several months instead of several weeks. I have had both these wonderful experiences in the middle of the country. During a 1,000 mile walk through New England (which began in Greenwich, Connecticut and ended in Burlington, Vermont), I zigzagged a lot to walk through not only the large towns but also the smaller towns to which I had been invited. I started among the apple blossoms--I walked among them when they were pink buds, and when their falling petals were as white as falling snow. I ended among the ripened apples, which supplied me with some tasty meals. In between I feasted on luscious wild strawberries and blackberries and blueberries. Throughout the country I saw much superhighway construction, and I noticed that these super-roads tended to run in the valleys, tunneling through the mountains and sometimes under the rivers. I'm glad that on my pilgrimage I usually followed the old roads that climbed the mountains. What wonderful vistas there were to reward those who attained the summit: sometimes views of towns or roads where I had walked or would walk, sometimes views of valleys covered with fields and orchards. I know that this is an age of efficiency and that superhighways are much more efficient, but I hope there will always be some scenic roads, too. Some roads that climb the mountains. People sometimes ask me how I spend holidays--especially Christmas. I have spent many of them walking. Many people go for a drive on a holiday, so it is a good time to contact people. I remember one Christmas Eve when I slept out under the stars. One planet was so bright that just a little imagination could transform it into the star of Bethlehem. The next day, at a temperature of 80 degrees, I walked into New Orleans to find poinsettias blooming abundantly for Christmas--and to find some fine, new friends. I spent one Christmas in Fort Worth, Texas, where the towers and the tall buildings were outlined with colored lights, presenting an unforgettable picture as I walked into the city. That day I was given the welcome present of enough time to catch up with my mail. People sometimes ask me if I do not feel lonely on holidays. How can I feel lonely when I live in the constant awareness of God's presence? I love and I enjoy being with people, but when I am alone I enjoy being alone with God. Most of the time in the early years I was offered food and hospitality by people I did not even know. I accept everything as an offering sent from the hand of God. I am equally thankful for the stale bread I received at a migrant worker's home as the sumptuous meal presented to me by a lady friend in the main dining room at the Waldorf Astoria Hotel. You know, after you have fully surrendered your life to God's will--if it is your calling to go out on faith--you will discover that even the food and shelter you need come to you very easily. Everything, even material things are given. And some amazing things are given that still surprise even me. I first got to Alaska and Hawaii through a wonderful gift from a wonderful friend. Then some of my friends asked me to consider leading tours there, so I led one to Alaska the summer of 1979 and one to Hawaii the summer of 1980. I arranged the tours to be an educational and inspirational experience for all who participate. We lived simply and traveled light. I was not idle while in our two newest states. Besides showing my friends around, I did a lot of speaking to groups and over the air. Some of those friends wanted to get an idea of what my pilgrimage life is like, and I think they did. It was a joy to share these inspiring places with them. I'll tell you another thing that happened: I was figuring out my schedule for North and South Dakota and I knew that in North Dakota I would have to interrupt my schedule to lead the tour in Hawaii. I knew it would be at Bismarck and I knew also that it would take me about a week to hitchhike back from Los Angeles, and I thought, "Oh, a week out of the North Dakota schedule and a week out of the South Dakota schedule. I could really use those two weeks in North and South Dakota." About the time I was thinking these thoughts, someone wrote and offered me air fare to and from Bismarck. It seemed almost like a miracle that it came. And of course this was something that I needed. I do not take anything I do not need, but I did need the time in North and South Dakota. This was a wonderful gift, which I accepted, and for which I shall be eternally grateful. So even the material things are provided. I explained to a reporter one time that I just talk to people and after a time they ask me if I want to eat. He pointed out that he had talked to people for months, even years, and they hadn't offered him so much as a sandwich. I told him, "But you're not a peace pilgrim!" Once a sixteen year old Mexican boy, who had heard me on the radio, raced out as I passed his home and excitedly extended an invitation to stay for the evening. His family lived in a poor itinerant sharecropper's cabin, but I can remember being treated as their honored guest. After a dinner of tortillas and beans, the family rolled up their only rug and placed it as a blanket upon their only bed. In the morning, before departing, they fed me another loving meal of tortillas and beans. While passing through Memphis, I scampered upon a wooden porch of a one-room house to escape a violent thunderstorm. A black family graciously offered hospitality for the evening. Their warmth was matched by the wood-burning stove that heated their humble home. They shared their meager food of cornbread and water for dinner and breakfast. We all slept on a bare, well-scrubbed floor. I will never forget the genuineness of their hospitality. One bitter cold morning a college student in Oklahoma gave me the gloves from his hands and threw his scarf around my neck. That night when the temperature had dropped below zero, an Indian couple offered me shelter. I was once warned not to go to Georgia – and especially not into Albany, Georgia, where fourteen peace walkers were in jail. But I cannot say I found anyone to be really unfriendly. In fact, hospitality was better than average. The people of minority groups I met took it for granted that I wouldn't discriminate. When they read Peace Pilgrim on my tunic, they seemed to trust me. They didn't hesitate to stop and talk. I spoke in a number of minority churches and several of the ministers read my message to their congregations. Of course, I love everyone I meet. How could I fail to? Within everyone is the spark of God. I am not concerned with racial or ethnic background or the color of one's skin; all people look to me like shining lights! I see in all creatures the reflection of God. All people are my kinfolk – people to me are beautiful! We people of the world need to find ways to get to know one another – for then we will recognize that our likenesses are so much greater than our differences, however great our differences may seem. Every cell, every human being, is of equal importance and has work to do in this world. You may order this book at the Peace Pilgrim site by clicking here.